Boston? Chicago? Which American city has the least pleasant weather? It's probably too hot in your city right now. But it could be worse: It could be too cold. In a new report published in Nature, Stanford scientists Yana Petri and Ken Caldeira have produced data that shows which large U.S. cities currently experience the most heating degree days and cooling degree days. The data also shows how those counts will shift given projected temperature changes in the Earth's atmosphere produced by global warming. Here, they define a "degree day" as the scale in deviation from 65 degrees, which they state "is the standard [U.S.] base temperature." For example, a day with ten heating degree days would be one during which the average temperature was 55 degrees. Ten cooling degree days would mean the average temperature on that day was 75 degrees. 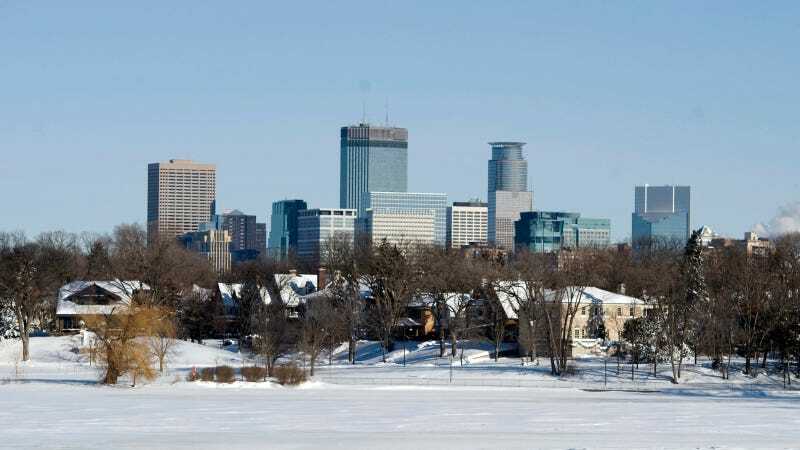 Right now (or at least according to data collected between 1981 and 2010) Minneapolis emerges on top as the city with the least pleasant weather in America, having racked up a total of 8,333 total degree days (DDs) (7,581 heating and 752 cooling). But this only tells one story. Minneapolis may have the least pleasant weather, but at least they're consistent: 91 percent of their degree days were heating degree days. In Phoenix, 84 percent of DDs were cooling-degree days. Another question we had was which cities have the worst of both worlds: lots of cooling and heating DDs. The data only provide a crude answer to this, since the authors only used 65 degrees as a benchmark and didn't count how many cities have had days that deviate from the expected temperature of a given day (no one expects it to be 65 in Chicago in the middle of February). In any event, using the data provided, Tulsa emerges among the top 10 cities as having the tightest balance of heating and cooling DDs, with a ratio of 1.9 heating degree days for every cooling degree day, followed by Wichita at 2.7, and Philadelphia at 3.5. Of course, the actual purpose of the study was to show expected changes in degree days. Here, the authors find San Diego is going to be most devastated by climate change. They project that it will see a 56 percent increase in DDs, the greatest jump for any large city—though the southern California city will still rank just 23rd overall in total degree days. Miami will also get hit hard as it shoots from No. 18 to No. 3 in degree day rankings when it sees a 37 percent increase in DDs. Denver, meanwhile, will see the greatest decline in degree days (26 percent), followed by Seattle (24 percent). And now the most important question: Who will take over as the most pleasant city in America? San Francisco, which will see a 6 percent decline in degree days that will push it up from 3rd fewest degree days to fewest. Those guys have all the luck.